There is a distinct difference between managers and leaders – one of them being how they deal with organizational change. A leader has an entirely different vision to that of a manager. Managers fear change because it upsets their carefully structured way of life — while leaders embrace change because they know that change leads to new ways of growth and accomplishment. 1. Change is Motivating: We’ve all heard the only certainty in life is death and taxes — but you also need to add change. It’s healthy and means progress is happening. True leaders don’t fear change; they embrace it with passion because they know smart, motivated people flourish in times of change. It also signifies that improvements are occurring. A true leader is open to input from their team and welcomes ideas, no matter where they came from. They are quick to praise and slow to admonish. Every new idea has the potential to make old ideas obsolete. The discomfort of the unknown is replaced by the excitement of discovery around the next corner. 2. Change is Exciting: People spend an average of 40 hours a week at their job. Some spend a lot more. The snooze button on the alarm clock is overworked because it’s very easy for the daily routine to become boring and monotonous. A smart leader embraces change to keep work interesting and exciting for themselves and their team. Think about your time at work. If it’s not enjoyable, do something about it today. Staff turnover is very high in organizations where boredom thrives. Keeping things fresh enables the business to retain staff for longer periods of time. 3. Growth Only Happens when Things Change: People and businesses stagnate if they don’t change. 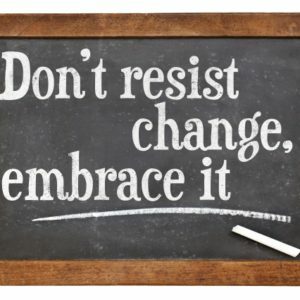 Personal and professional growth only happens if changes are encouraged. Leaders become better. Staff gain more skills and become more confident. Followers are empowered to become leaders. Organizations benefit from a financial and a personal point of view. Offices don’t make a company successful. People are the fuel for success and empowered people can literally do anything. 4. To Change is to Become Part of History: Think back 25 or 50 years. Compare to today. There have been so many amazing changes to the world we live in. These changes were made by individuals and groups of people who dared to take risks and challenge the status quo. The best way to predict the future is to envision it, then create it and take others along for the ride. Space travel is now possible. Computers. Cellular phones. What was once only in the imagination of a science fiction writer is now part of our daily lives. Science fiction meets science fact. It all begins with personal belief and a single step. Life is for living. True leaders don’t fear change. Nothing great is ever accomplished easily. But those who go on to achieve great heights will tell you that it was well worth the ride. Leaders embrace change with open arms and are willing to step into the void to discover what’s out there. Becoming a better leader is a powerful motivator as we have seen so far. Thank you so much for this! I am set to change some ideas to actions! Very insightful post. As they say “change is inevitable.” You are spot-on on the 4 principles of change. I just want to add, that a good leader should be strong enough to walk through the change process – from envisioning, initiating and until overseeing it. Then, prepare and sell your idea to your team. Make sure that all of them are on board before making it happen.